Your dailies will eventually give you a Superior and reinforced gollux ring, sweetwater glasses and tattoo. Buy an emblem. Epic potential your gear with epic pot scrolls and focus on weapon, secondary, and emblem and try to get %att lines and then tier everything else up with the cubes you get along the way. Once you have a better range, leveling up should passively give you more range which will allow you to do dailies more smoothly and with the mesos you make I'd buy High quality dimension gloves. Wait for a spell trace event and then spell trace your gear with 15% or 30% scrolls, make sure at least half of the slots are successful or else innocence scroll it, and if half are successful, finish it up and star force it. Star forcing gives a lot of extra stats but can only be done after all the scroll slots are used up. A. Sell them clean and earn enough money to buy perfectly scrolled superior and reinforced gollux rings. B. Scroll them yourself which takes more time and might be the same cost as buying perfect premade rings from the auction house depending on how lucky you are with the gollux scrolls and clean slate scrolls. For the other two rings I'd ask for advice from someone else since I'm not 100% sure what rings are best in slot. For free totems I've heard you can finish the afterlands theme dungeon. You can also grind for better, but time limited totems around Yu Garden, but since time is money. I'd skip this method. The best totems are either gambled with NX or rarely come around with events. I think your one of your job instructors should give you a free emblem since if I'm not mistaken all classes get one with relative ease. 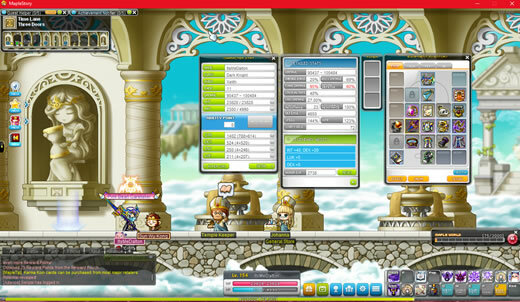 Don't forget to from maplestoryer.com to buy cheap and safe Ms mesos, which is the best choice for Maplestory mesos services on the market!